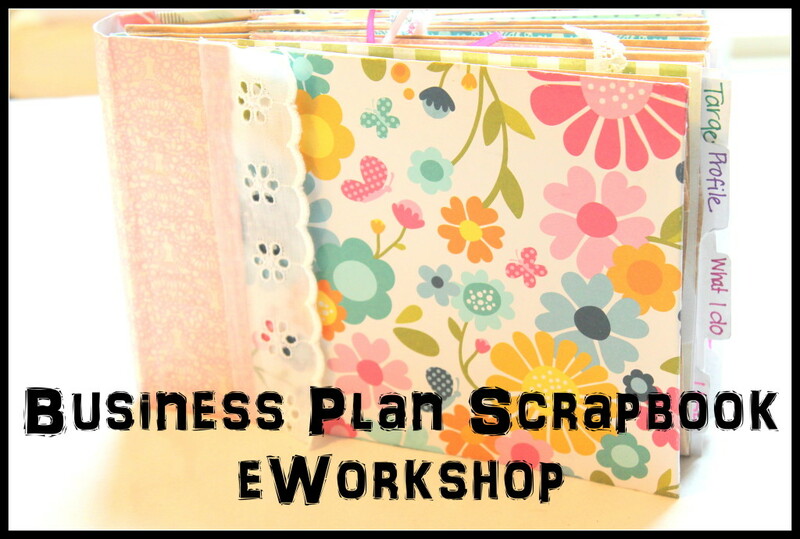 I’m so very excited to share this brand new eWorkshop with you: Business Plan Scrapbook eWorkshop. I have been in business for years, and for years I have written a business plan because that’s what they told me to do. I had a template (a lot of which didn’t particularly make sense to me) and filled it out the best I could. I printed it, put it in a file folder and filed it away, never to be seen again. What’s the point of that, really? I didn’t need a loan, I wasn’t going for government grants and I wasn’t looking for investors. Why did I need a business plan? Well, I obviously didn’t get it back then. I would revise it maybe one or so a year, and then return it to its folder. Until last year when I had a realization: I wasn’t using the business plan because I didn’t create it for me to use. I created it for someone else to use, except no one else really needed to use it. I did. I thought about what would make me want to look at it and use it more often. It had to have sections that were helpful to me. It had to be cute. It had to be something I would actually want to look at – not a boring word doc on my computer or in a file folder. Then I had a brilliant idea: Paper bag scrapbook! It would be fun to make and it has tons of pockets to stash stuff in. Some parts I still printed on my computer, but I then glued it and embellished the heck out of it. Guess what? I used my business plan last year. I checked in with who my target market was, I followed my promotions. Etc. Now I want to show you how to do this. You want to make your vision for your business clearer. This is a self-paced, work at your own speed workshop, which includes videos of how to actually make the scrapbook and PDF sheets to help you with the business plan part of it. PDF worksheets to work out your business plan. Then you get video tutorials to learn how to make a paper bag scrapbook. A PDF with everything and access to the eWorkshop site that also has everything that you can access anytime. When you purchase the eWorkshop, you’ll receive a PDF with everything you need to log in and gain access to the eWorkshop site! This entry was posted in Business and tagged business, business plan, business plan scrapbook eWorkshop, creative, emerging creatively, kimberlie Kohler, paper bag scrapbook, scrapbook, tutorials, videos by Kimberlie. Bookmark the permalink.